Renee & Jeremy are back again with their latest release, “A Little Love,” and this time it’s a little different. The fourth release from the L.A. based duo is a series of covers built on the theme of universal love. The duo hand-picked some of their favorite songs with very specific criteria: the lyrics should encompass this theme and be family friendly. I was initially intrigued when I first heard that the duo was going to do a cover album. Cover albums come in all kinds of flavors and some try very hard to recreate an original but sometimes fall short. 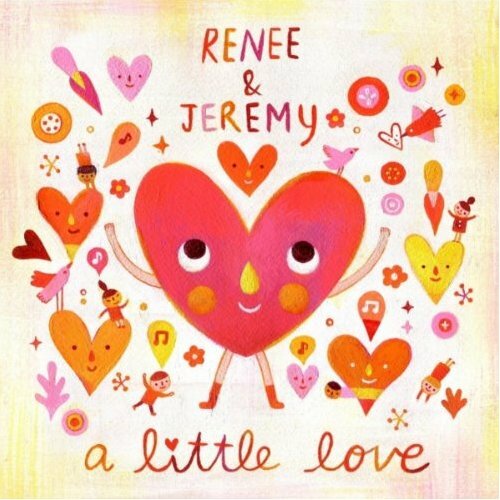 “A Little Love” is a perfect example of how Renee & Jeremy don’t try to imitate, they simply and effortlessly recreate in a very natural and harmonious way, resulting in a folksy groove that just makes you feel good inside. What I also love about the album is how well it transitions from track to track. The songs flow together like a clean baton hand-off during a relay race. Although the album falls under the genre of kids music, I could absolutely see it being played on adult contemporary radio stations as well. Suitable for all ages, “A Little Love” once again makes a point of reminding us just how lovely and talented these two artists are. You can view samples of the album, as well as, purchase digital copies at Renee & Jeremy’s website. Physical copies of their albums are also available at the usual places, i.e. CDBaby and Amazon. I’ve also included a hauntingly beautiful video of Coldplay’s “Yellow” performed by Renee and Jeremy and directed by Jon Izen. **Updated: Renee & Jeremy also released a video from the Red Hot Chili Peppers’ cover of “Give It Away” which can be viewed here.